New to Solidworks PDM or considering it as a solution at your company? Maybe you have used Solidworks PDM for years but workflows are still a bit of a mystery? I hope to provide you some workflow basics that will take some of the mystery out of how they are configured and their benefit potential. This is not a replacement for Solidworks PDM Administration Training or a comprehensive functional description. As always, Inflow Consultants are available to assist you in any Solidworks PDM activities that you find beyond your current capability. Here are some simple terms that will help you to understand the concepts presented. A work product in this context would be a document or set of documents that need to be shared or controlled in the vault. Control may be related to group or user permissions, Revision management, information or all the the above. Your solidwork assembly, part and drawing files for a specific product or project might be an example of a work product. Other examples might be single documents like a sales order, work order or ECO/ECR/ECN, etc. A state is like a task in your workflow. There is typically a duration of activity being performed with clear prerequisites and requirements to enter and exit that state. These will look like rectangles in your PDM Administration tools workflow design. A transition is an action or decision to move your vaulted documents from one state to another. These will look like arrows in your PDM Administration tools workflow design. How many Workflows do you need? First, every file checked into the vault will require a workflow. This is not as difficult a task as it may seem. Workflows may vary from a single state or dozens of states and transitions. For example, CAD files or other design documents typically need some type of revision control and permissible access defined. Other types of files may only be added to the vault for sharing or archive. The latter will have very simple workflows and likely be a single state. Next, examine everything you wish to put in the vault and then separate each work product into categories for how they will be managed. The more common categories might be; Complex Revision Management, Simple Revision Management, and No Revision Management. Once you have decided the level of Revision Management for your documents you can organize all documents by these categories when they also match on revision scheme. Typical revision schemes may be A-Z (alpha) or 0-99 (numberic) or a combination A1, A2, etc (alpha numeric). What are the different types of workflows and how do I determine their construct? Now that you have determined how many workflows you need to create for all your work products you can start designing each workflow. Here are a few things you will need to define to do detailed configuration of your workflow. How many revision schemes does your work product require. You need a “loop” mechanism for each type of revision scheme your work product may transition to. For example, in a 3 loop workflow a document or set may have a prototype revision (x1, x2, etc), a Production Release Revision (A, B, C, etc) and a Minor Change Revision (A1, A2, A3, etc). 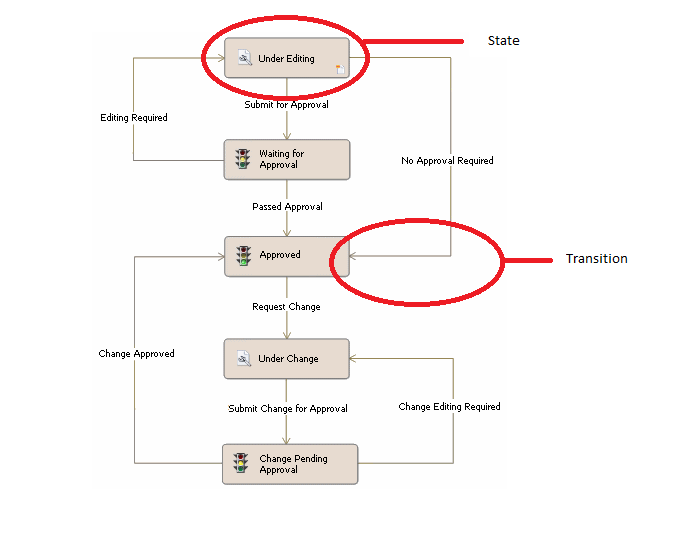 Loops often consist of A transition that sends the work product to a state to decide on a revision change, a state where that change is considered, and a transition that approves of the decision and a transition that sends that work product back to the prior state for corrections. If there are multiple approvals, will you be performing those in sequence or in parallel and who are the owners of those approval actions? Will you want exceptions to bypass any of those approvals or will your work product always require that specific approval? Will all owners have access to the PDM Application or will you need to designate another group to reflect that approval in Solidworks PDM? How do you ensure files get assigned to the appropriate workflow? Each workflow has something called workflow properties associated with it that you define. These properties are essentially Boolean arguments that will each evaluate to true or false and may be combined with AND/OR Logic. When you check a file into the vault, PDM looks to the first workflow listed (this is not something you are aware of as it is executed almost instantly), it evaluates the first workflow property for that workflow. If workflow properties evaluate to true then it moves on to the next property for that workflow. If all are true, then that file is assigned to that workflow. Otherwise, it moves on to the next workflow in the list and repeats the process. If all workflows are evaluated and none had evaluated true for all workflow properties, then the user gets an error that “this file does not meet the conditions of any workflow”. Conversely, it is important that workflows have properties that make them mutually exclusive from each other. If two workflows have properties that all evaluate to true for a checked in file then Solidworks PDM will assign it to the first one of these workflows it encounters which may or may not be the desired outcome and likely may not be a “consistent” outcome for that type of file. What are some of the additional things you can do in your workflow? Users or groups can be sent an email notification when important decisions are made like approval by manufacturing or when a file has been waiting for approval longer than an acceptable period. Meta data can be validated to ensure it is filled appropriately out by the originators.